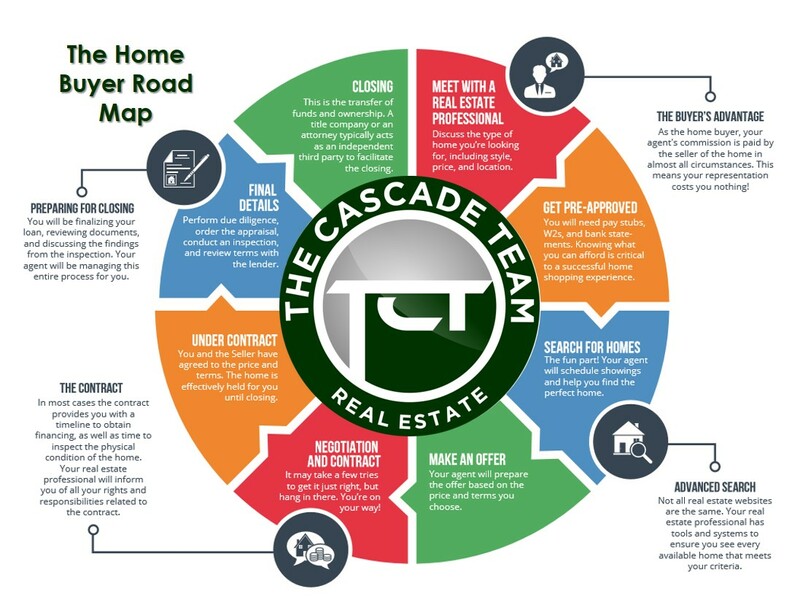 The Cascade Team is a real estate brokerage whose focus is centered on customer service. Our customers are our number one priority and our local agent team works hard to not only find properties that meet your needs and wants, but also leverages their local market knowledge to help guide you through the home search process. Our commitment to excellence in service is unparalleled in the areas in which we serve. While we offer a number of online tools to assist you with your home search, having a knowledgeable local agent to guide you is so important, especially when the local market heats up. Multiple offers, escalation clauses, negotiations, etc., are all critical items in helping you secure your new home, and that's where our service and local knowledge sets us apart. 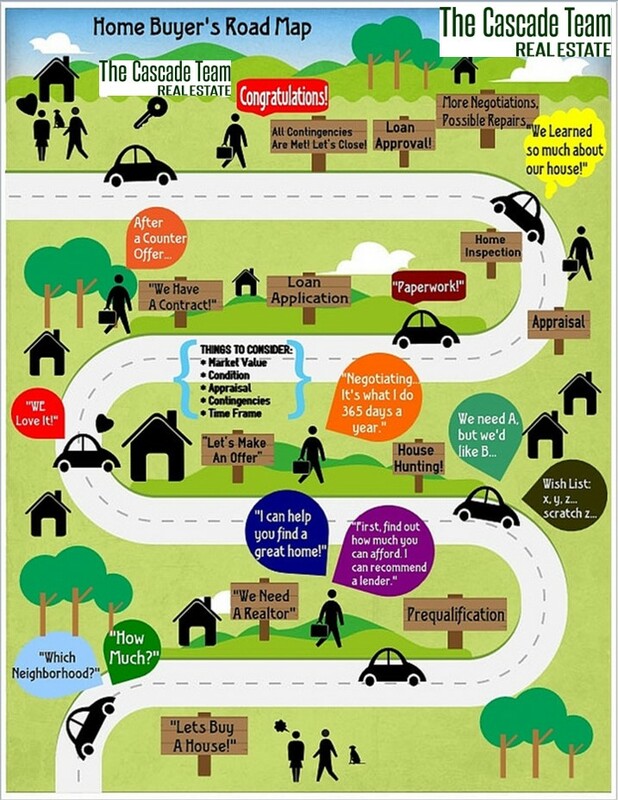 Below is a standard “Road Map” that explains the typical process for buyers to close on a new home. Of course there can be many variables along the way but this gives a good run-down of what to expect from a typical transaction. Meet with a real estate professional: Discuss the type of home you're looking for, including style, price, and location. The Buyer's Advantage: As the home buyer, your agent's commission is paid by the seller of the home in almost all circumstances. This means your representation costs you nothing! Negotiation and Contract: It may take a few tries to get it just right, but hang in there. You're on your way! Closing: This is the transfer of funds and ownership. An escrow, title company or an attorney typically acts as an independent third party to facilitate the closing. As you begin to think about buying a home, you're probably acutely aware that this is likely to be your greatest investment ever (short of children or a good marriage), and you might be wondering if there's anything you really need to know as you go into this process. This is where your real estate professionals come in. With the help of a trained agent, you can come out on top of a closing that might otherwise have pushed your retirement ahead a decade!